I know you all have a lot of reading to do, so p art of our mission here at the Whisperer is to do some of the reading for you and bring you book reviews which might be of interest. This book represented a conflict of interest for me as I have a chapter in it with my colleagues Lindy Osborne and Glenda Caldwell about ‘Shut up and Write!’. Luckily I was able to pass this one on. Paul Farrelly is a PhD candidate in the Australian Centre on China in the World. In addition to researching the cultural history of New Age religion in Taiwan, he is also a contributing editor at The China Story. Paul is on Twitter at @paul_farrelly. Most PhD students enter their candidature having been praised throughout their education as “smart” and, perhaps, “a good writer”. Left unsupported these qualities cannot be relied on to produce the type of extended, coherent and innovative research necessary to satisfy doctoral supervisory panels and examination committees. Writing a thesis will almost certainly be more intellectually demanding than any prior work and not having written anything as long or complex can be intimidating. In recent decades the act of writing has been increasingly recognised as an important academic skill. It has direct implications for employment and departmental income streams. Writing is a practice that needs to be fostered. In light of such pressures, writing groups are one way that PhD students have been encouraged to develop a sustainable and productive writing habit. 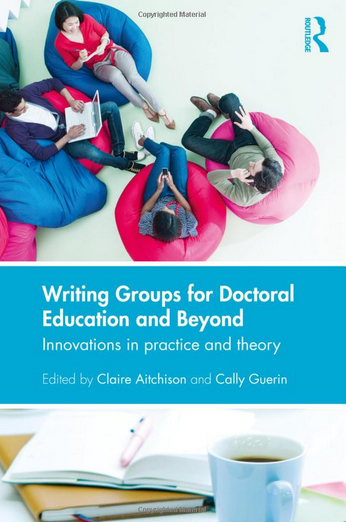 Writing Groups for Doctoral Education and Beyond: Innovations in practice and theory (Routledge, 2014) offers a range of theoretical insights and practical reflections on writing groups for doctoral candidates. As Anthony Paré noted in his context-setting chapter on theoretical and historical perspectives on writing groups, “Almost 50 years of arguments support a collaborative approach to learning, and still students compose alone” (p.24). Writing groups are one such collaborative approach and something that probably requires more consideration from the wider academic community. A centrally organised group of three. Set up after a university-wide writing group workshop in mid-2011, we sustained this group for about six months until fieldwork intervened and we lost momentum. It comprised one member from the humanities (me) and two from the social sciences. A group selected by a post-doctoral researcher. All members were focussed on East Asia and were primarily historians, with one anthropologist. Once again, this group also lost momentum (again primarily due to fieldwork absences) and folded in late 2013 after about 9 months. The ‘thesis boot camp’ organised by the research skills and training team headed by Inger Mewburn. I went to the first boot camp in January 2014 and since then have attended nearly all the monthly ‘veterans’ days’. Members are mainly later-year PhD candidates from across the campus. Like a flab-busting boot camp, I think the benefits of this method are most apparent over the long term when sustained practice follows the initial intense burst of training. As an evidence-based assessment of a wide range of writing groups where knowledge is produced in an institutionalised environment. It was in the second point where I found great value in this book. Writing Groups is divided into 15 chapters, each of which is less than 20 pages long. As you would expect from professional writing instructors, the text is uniformly clear and pleasant to read. While two authors introduce theory that almost overwhelms their empirical material, the intention of the book—reflections and analysis on the pedagogy of PhD writing groups—remains present throughout. There is a significant body of work about PhD writing groups freely available online which begs the question – why buy and read this book? The authors in Writing Groups offer a deeper and more considered critique than what is often found online and the extensive bibliographies provide the engaged reader with many departure points for further research. Most importantly, Writing Groups is built around observations grounded in years of practice and experimentation. Reading such considered accounts of doctoral writing groups was fascinating. About two thirds of the chapters drew extensively on the voices of workshop participants, as gathered through surveys and other data collection. While there is a risk that promoting participant voices can distract the reader (particularly with block quotations), I found such quotations to be one the book’s strengths. In directly inserting the (selected) voices of writers into the text, the authors made their workshops and the subsequent analysis both real and relevant. Defining a writing group very broadly (“more than two people come together to work on their writing in a sustained way, over repeated gatherings, for doing, discussing or sharing their writing for agreed purposes” p.7), the authors explored the topic from a range of perspectives. While the examples all drew upon experiences in Western universities (admittedly from many different countries), the different formats (shut up and write, marathon, weekend retreat, student and supervisor together) and different cohorts (women, multilingual, design/practice-led) lent Writing Groups a solid and distinct foundation upon which authors could build their analysis. There is a recurring theme that writing groups are safe places where students can experiment and develop. Yet Writing Groups is not a complete love-in (despite all writers supporting the concept). Doreen Starke-Meyerring, in her chapter ‘Writing Groups as Critical Spaces’ offered some critical reflection on the limits and risks of writing groups. In her conclusion, Starke-Meyerring posed the poignant question “Created under pressure to make doctoral writing happen in institutional cultures that marginalize writing, do writing groups run the risk of research becoming ad hoc, add-on spaces where doctoral writing is kept apart from the research cultures doctoral students are entering?” (p.79). This is an important consideration. In my school two thirds of PhD candidates are non-native speakers of English. Having shared many conversations about the challenges of churning out a thesis, I feel the general anxiety about dissertation writing is slightly more present in this cohort. Linda Li’s chapter ‘Scaffolding the thesis writing process: An ongoing writing group for international research students’ emphasised the importance of recognising the diverse experiences and needs of non-native speakers of English. For me this chapter was particularly useful, and would be relevant to anyone in Australia considering PhD writing groups. As a dedicated writing group participant, I found Writing Groups to be informative and affirming. For better or for worse, writing is the act upon which academic success is gauged and this book appears as part of the growing interest in group work and how writing habits can be fostered among graduate students. It enabled me to self-reflexively reconsider my writing habits when in a group and when on my own. Importantly, readers will be left with no doubt that just as there is no perfect way to write a thesis, there is also no perfect way to conduct a writing group. The social and collaborative nature of writing groups lends them a malleability that needs to be considered for each situation. That said, feedback and support are important dimensions of any successful group. Not surprisingly, I recommend Writing Groups for those who are involved in a writing group, or who are considering starting one. If you are trying to convince a sceptical administrator or professor of the value of a writing group, then referring to such a theoretically-informed and well-referenced book will be helpful. I hope that application of the findings in Writing Groups will see the proliferation of successful writing groups, and that the act of writing a doctoral dissertation ultimately become smoother for all involved. Thanks Paul! What about you? Are you a regular member of a writing group? What value do you see in participating in one? Buy this book from this link and your purchase will benefit The Thesis Whisperer. This entry was posted in Book Reviews and tagged writing groups. Bookmark the permalink. Hi, I have just started a Shut Up & Write group in my building at Uni Adelaide. Momentum is building and I’m hoping to make it a much more regular event. I am so excited to get this book – great timing. Glad to hear it Clare and I hope the book is useful. Paul, you listed some writing groups you’ve been involved with and their longevity. At Griffith, in the education and music schools, I’ve seen a few come and go, and I’m not sure I can put a finger on why they didn’t last longer than 6-9 months, other than that they were convenient for a time and then they weren’t. You mentioned particular unifying research interests or shared experience (like international student groups) as being one kind of rallying-point, did you have any other insights into what can keep a group going? Thanks for your question and sorry for my slow response. I have been avoiding the internet in a vain attempt to do more academic writing. There is an anthropology writing group at ANU that seems to have been going forever (sometimes it is so popular that it splits into two, from what I hear!). I think what ensures its longevity is institutional support. While students come and go, there are academics who see the value in supporting the group and are there year after year. I’m not sure of the exact departmental arrangement that supports this group, but I imagine this is what keeps it going. From what past members have shared with me, the positive aspects of the anthropology writing group derive from the fact all members are anthropology graduate students dealing with ‘writing up’ (as they all seem to call it!) and that the senior academics are really supportive.